Life has been crazy busy for me lately. While my goal has been to have a post a day, which means 365 musings, this year, it's not working out that way. I'm finding that herding my thoughts together has been a lot like herding feathers in an updraft. It's just not happening. I'm also finding peace with not being able to have a blog post a day is elusive and that adds self-imposed stress, stress that you know and I know is not needed and silly to have, but it's there. In addition, my fall allergies are ramping into high gear making me feel worn out. It's been hot and dry here, which adds dust to the air, in addition to the fall pollen. I'd rather have the windows open but the air coming in is like a sirocco, and fans don't keep it cool enough. Pilchard has taken to sleeping on top of the furnace in the basement because it's cooler down there. I dropped the thermostat one degree today, from 80 to 79, because the house seems so stuffy. I do like hot days. That's what summer is about, but give me about 3 or 4 in a row and then have it cool off. My favorite season in the year is approaching. I'm going to change the wreath on the door from the one I put up in late April to the fall one Carole and I made 10 years ago. Mum plants are everywhere and Halloween stores are opening this weekend. Hallmark has been pushing Halloween decorations since the beginning of August. Football starts on Saturday. But, the biggest harbinger of fall is what the squirrels are up to. I came home from Virginia to find dirt all over the deck from the pepper plants. 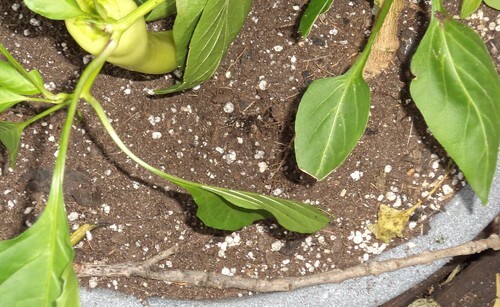 You can't really see this, but there is a hole dug into the dirt in the pot where the peppers are. As fall approaches, I see more and more of this as squirrels look to bury the nuts they find to keep them safe for a food resource in winter. If it wasn't the peppers, it would be interesting. I'm also not quite sure what to make of this. 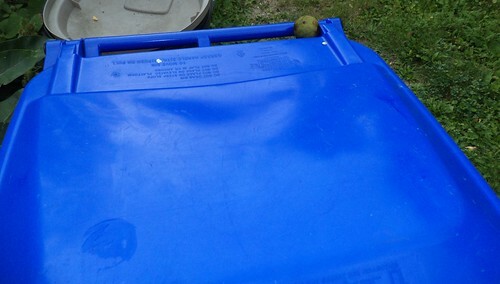 A couple years ago, a squirrel got under the lid and shoved a walnut into the joint in the lid. Were they trying to do that again? Before wheeling the recycling bin to the curb, I put the walnut on the deck railing. It was gone in the morning. I kind of miss the annual walnut gathering expeditions we used to have when I was a kid. We'd bring the nuts home and spread them in the basement to dry. Then you'd wear gloves to remove the outer layer. (Walnut outer layers stain. It was used as a dye by Native Americans.) After that, we'd dry the nuts again. When you could hear a rattle when shaking one, dad would put some in the drive way and run over them with the car. That was great fun. Otherwise, you'd sit on the back stoop with a hammer and crack the tough shells that way. One person would crack, the other would pick out the meats. Mom would remind us to have more meats in the dish than in our stomachs. I'm not sure where they get the walnuts. I'm not aware of a tree in the neighborhood but if it's in someone's back yard, I wouldn't know about it. I almost took it as a peace offering. Sorry we dug in your peppers. Please accept this walnut to express our apologies. I fixed the dirt in the pepper pots so we'll see. They can dig in the marigolds or even the geraniums, just leave the peppers alone.